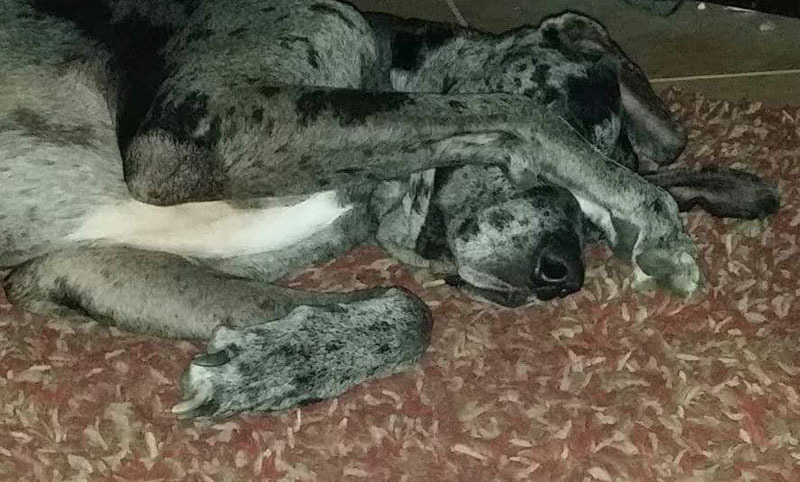 I need to rehome my Great Danes. I have 7 dogs, 6 of which are rescued. I've had the Danes for over a year & will be hard for me to give them up. My reason for the decision is that the dogs are no longer getting along. When 2 dogs fight they ALL join in. I'm 67 years old and I've had a stroke and can no longer break up fights. I've been lucky so far. This will 'BREAK MY HEART'. The male wants to play. The female is laid back. They were brought up with my grandson who is now just turning nine years old. They DO NOT BITE although they are convinceing watch dogs. They are up to date with shots & are I.D. chipped. NONE OF THIS IS THEIR FAULT. THEY HAVE NEVER BEEN THE AGGRESSOR. My mastiff started the last fight that caused damage. They don't like cats. I will need to rehome the others (except the mastiff) as well. Timber & Macy. 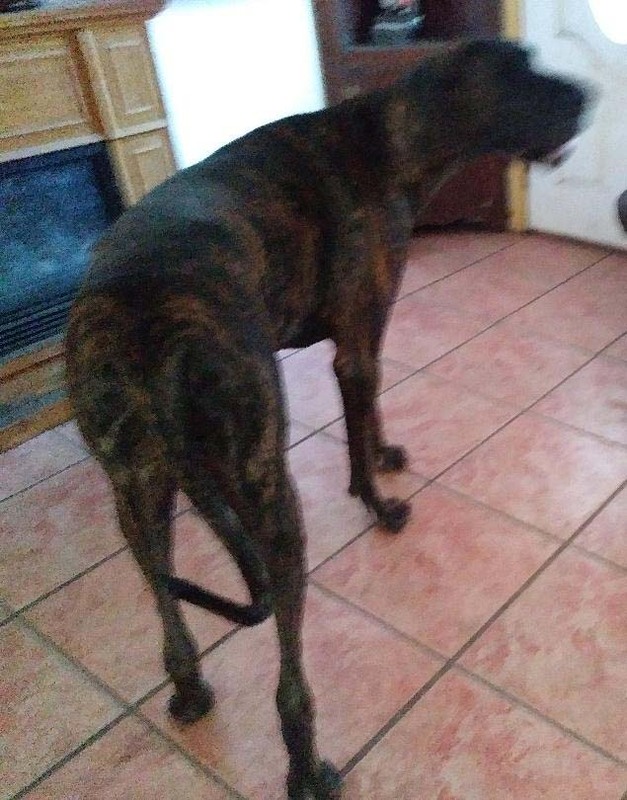 Timber (male brindle) is about 4 years. Macy (female) is about 5 years. Hello I just spoke with you on the phone about my Great Dane. Here are some pics of her. She's 8 or 9 I'm not sure which. They are the only ones I have on my phone. I can send more later if you need them. My name is Shannon and I just spoke with you about Oakley. 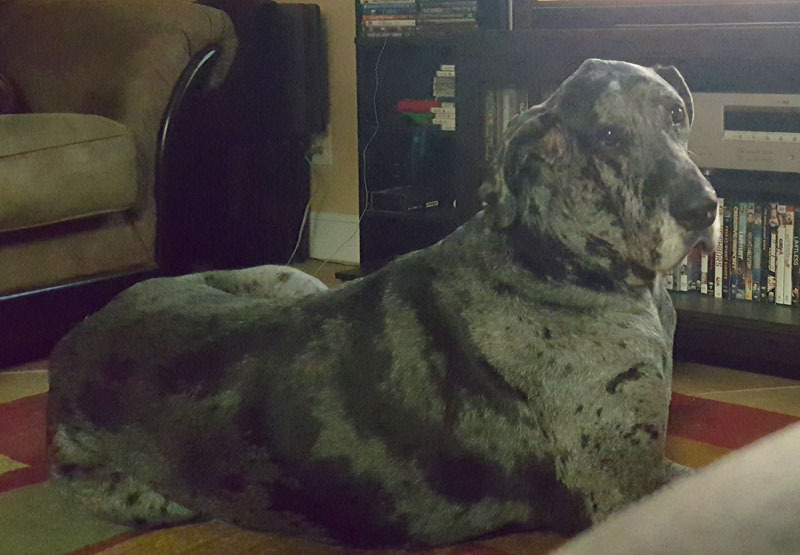 He is a 6 year old Male Blue Merle. He was born march 10 2011. He is purebred (however no papers). We have had him since he was 8 weeks old. We recently adopted twin toddlers and had a baby shortly after. Oakley has always been good with people, however now with three toddlers in the home he is on edge and uncomfortable and spends his days confined behind a baby gate. He has never been aggressive towards the children, however he is uncomfortable around the little ones, unless he is eating their food. He is good with other dogs and cats and older children over 10 years. He is protective of our home to strangers but friendly to family and friends. We have had a lot of foster care workers in and out of our home weekly for the last two years and Oakley seemed well adjusted to the visitors. He is neutered and up to date on shots. This is a very hard decision for our family, as we love him very much. Any help would be greatly appreciated as we want him to go to a good home and be safe. Please let me know what else you may need from us. He is a 1 year old male. Contact info...Troy 407-927-6766. 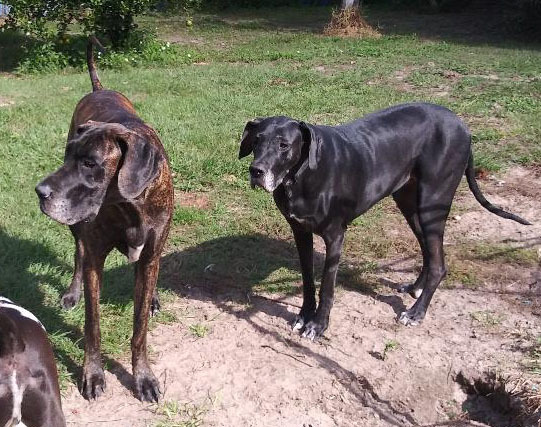 I am a volunteer for Friends of Citrus County Animal Services (FOCCAS) in Inverness, and a citizen has contacted me about surrendering two Great Danes, 1 male and 1 female, 4 years old asap. I will send you to the owners, message me - just helping spread the word. "Hello, my name is Brian. I understand you may be interested in adopting my Danes. Not sure if you were interested in both or not. They are great lovable dogs, they don't like other dogs though. Maybe with proper training they could be. My male especially get jealous of other dogs, I think that's more of it than a dominant thing. (left) Black female utd on vaccinations and spayed. 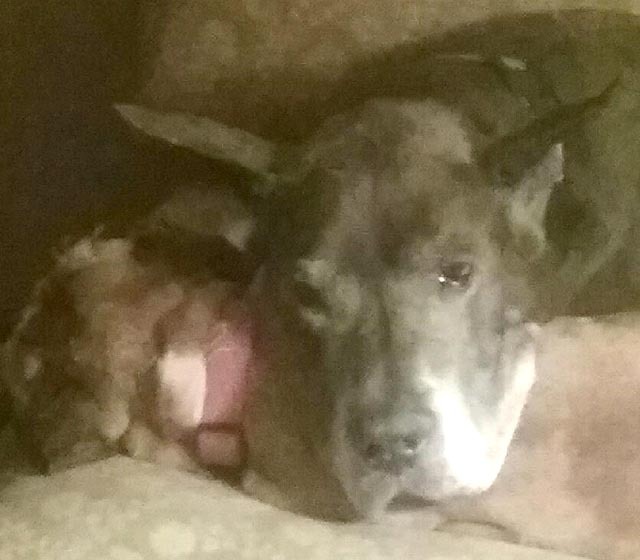 Male on right needs to be only dog in mature family, neutered. Both 4 years old." Male, blue merle, fixed. He is 6 years old and will be 7 on July 28th. He has early stages of hip displasia, has thunderstorm anxiety, and is very lovable. I can't financially support him after I get divorced which is why I am trying to find a home for him. His name is Bull Dozer, aka Dozer. 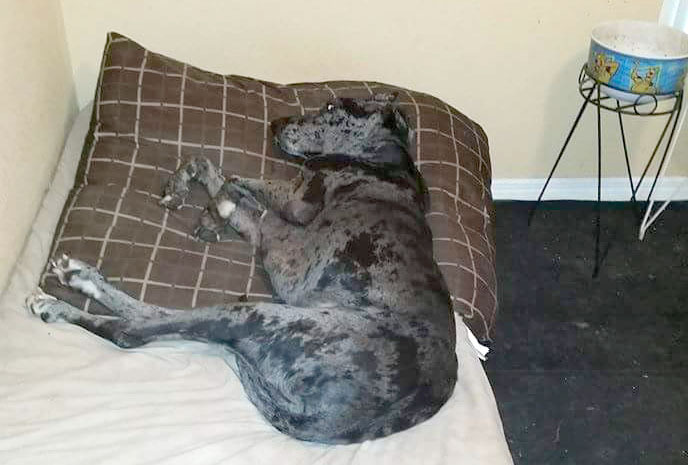 Gracie is a 5 year old female blue merle, with cropped ears. She is good with small dogs. Housebroken and very sweet. I'm terribly sorry for the delay in responding to all of you that are interested in adopting, but I have been spending most of my time down in Fort Lauderdale taking care of my father who was dying from pancreatic cancer. My mother has Alzheimer's and he was her care giver. She is very angry, confused and combative. My emotional and physical energies have been focused on them and cleaning out their house. 75 years of memories is very heart wrenching. Adoptions and intakes are currently on hold while we try to regroup and get back on track. I hope you find the perfect life long companion for you and your family. The people that have given me their personal info and pictures of their dogs to place on the website can be contacted directly. Zoe is a 14 month old black female. She loves the dog park and is great with kids (as pictured!) Owner gave her up due to heavy work schedule and no free time. 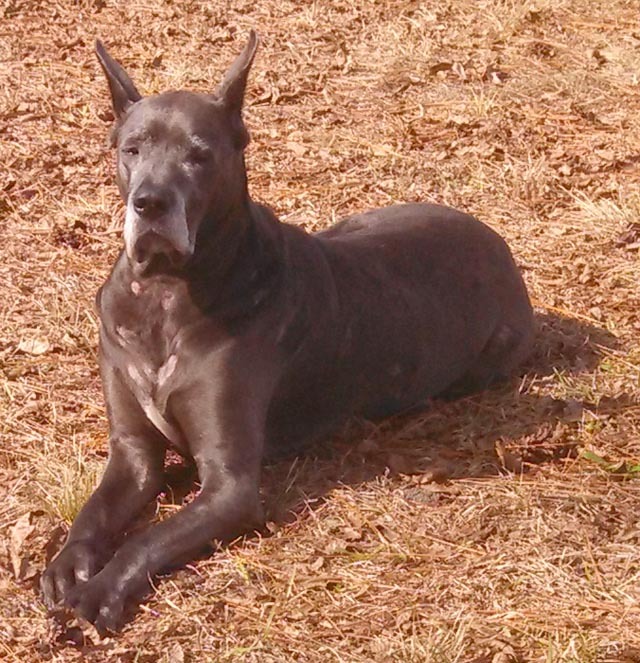 Jack is a 2 year old black Dane. He is good with kids, cats, and dogs. His owner couldn't keep him, so he is living in a foster home right now. Nicky is a three year old black boy with white feet and chest. He has natural ears. He is available because his owners got divorced. He is very thin but very tall with a blocky huge head. No other dogs. He says they taste good! Sadie is a three year old black female. Her owner didn't want her anymore. She is very shy. Not good with kids. Good with dogs and cats. Dakota 1-1/2 year old brindle male with natural ears. He is an active boy with a spring loaded rear end! He us very sweet and does well with other dogs. Former owner did not want him anymore. Moose is a 14 month old black male with natural ears. 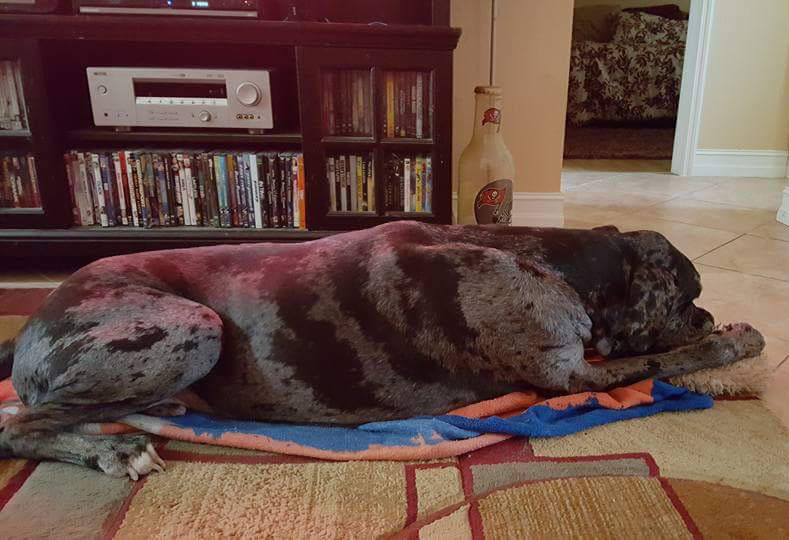 He was given up by his owner because of he was too large and she couldn't handle him anymore. He was living with several other dogs. He is very sweet and very wonderful. Would love to keep him myself! He is just a big goof! Shiloh is a 10 month old black boy with natural ears. We have him as a result of a drug raid by the police. He was kept in a tiny kennel. Does not get along with all dogs, but is very nice. Fiona was one the dogs rescued from the Polk seizure in Lakeland. She is the littermate sister of Arrrgyle. She is very sweet and a little shy. She had to have most of her tail amputated because of a deep bone infection. She loves other dogs. Puppy Mill Rescue 11. Royce. 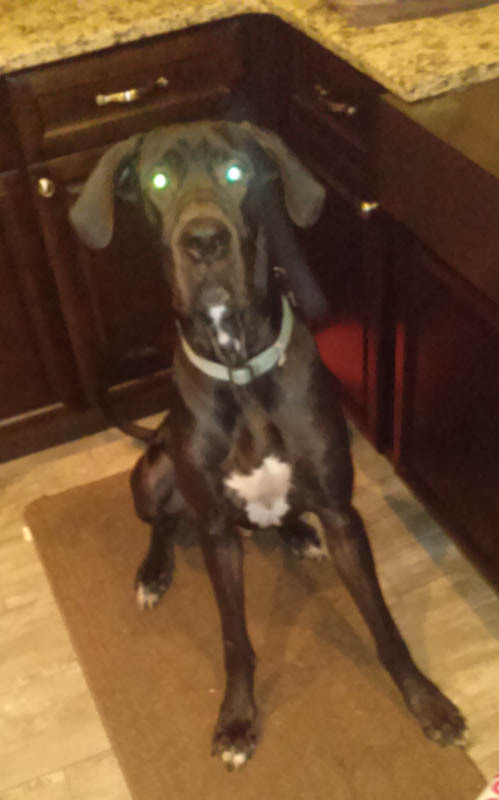 117lbs 18 month old black male. White chest and feet, severe mange, open sores on muzzle, major hair loss, swollen back legs. Shy, quiet, does not approach.